Bhartiya History - Mahabharat 3139 B.C. you are now: HOME > Bhartiya History > Mahabharat 3139 B.C. greatest poet, writer and the literary figure of his time and Aryabhatt, the greatest astronomer and mathematician. 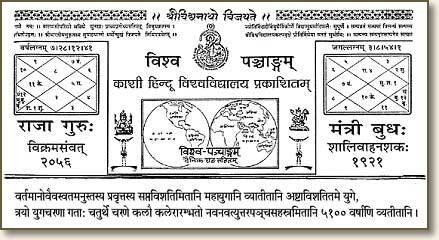 There are astrological, natural, geographical, physical, inscriptional and scriptural evidences that unquestionably establish the date of Mahabharat war as 3139 BC and the beginning of kaliyug as 3102 BC. The dynasty of Surya Vansh of Kaushal (Ayodhya) ends with Sumitra (Bhagwatam 9/12/16); the dynasty of Chandra Vansh of Hastinapur ends with Chemak (Bhagwatam 9/22/44, 45); and the dynasties of the kingdom of Magadh flourished up to the Gupt dynasty (80’s BC). The kingdom of Hastinapur, after Chemak, was constantly ruled by the people who took over the throne. 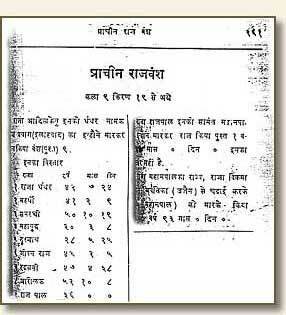 An ancient book describing the date-wise chronology of all the kings of Hastinapur (Indraprasth or Delhi) from Yudhishthir up to Vikramaditya was found by the proprietors of the fortnightly magazine of Nathdwara (Rajasthan) called “Harishchandra Chandrika and Mohan Chandrika” in about 1872 AD. The proprietor of the magazine printed the entire description in two of its issues (called kiran) 19 and 20 of 1882. The figure above is only a section of the magazine. It gives full date-wise detail of each and every king who ruled Hastinapur from Yudhishthir up to Vikramaditya. This is one of the rarest records that survived through this magazine. The description is detailed to year-month-days of each and every king who ruled. By adding the total number of years of the four dynasties from Yudhishthir to Vikramaditya, it comes to 3,148 years which is 3111 Kali era or 9 AD, which represents the date when Vikramaditya left this earth planet. Vikramaditya ruled Hastinapur for 93 years from 83 BC to 9 AD. 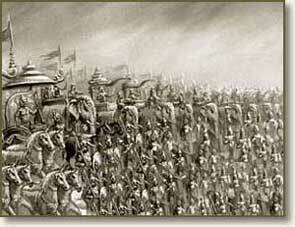 Accordingly, the date for the Mahabharat war comes to (3148 – 9 = 3139 BC). According to the Bhavishya Puran and Rajtarangini, Vikramaditya lived between 102 BC and 15 AD; and according to the above details his period ends by 9 AD. There is only a difference of 6 years in the date-wise record of 70 kings who ruled Hastinapur for 3,055 years. A discrepancy of 6 years in 3,000 years of record could be a copying or printing mistake, and is thus negligible when dealing with a longer span of years. The unbroken chronology of the exact dates of all the Hindu kings of the 4 dynasties that ruled Hastinapur (up to Vikramaditya) since the reign of Yudhishthir is the most potent evidence that Mahabharat war had happened in 3139 BC. It says on page 3 that 5,100 years have already elapsed before 2056 Vikram year which is 1999 AD. It means that the existing Kali era is 5101 in 1999 AD, which comes to (5101 - 1999) 3102 BC. “When the three yugas (satyug, tretayug and dwaparyug) have elapsed and 60 x 60 (3,600) years of kaliyug have already passed, I am now 23 years old.” It means that in the 3,601st year of Kali era he was 23 years old. Aryabhatt was born in 476 AD. Thus, the beginning of kaliyug comes to 3,601 - (476 + 23) = 3102 BC. Lord Krishn ascended to His Divine abode at the end of dwaparyug and immediately kaliyug started in 3102 BC. When Bhagwan Krishn left the earth planet and ascended to His Divine abode a catastrophic rain, storm and sea deluge, that lasted for seven days, totally drowned and destroyed Dwarika town. This catastrophe was also recorded in Babylonia’s ancient town Ur (which was mythologized in the West as Noah’s flood) and the ancient Mayan records. The dates of both are the same.